« Day 31 – Marcos D.
"The Amazing Kim Perry" volunteering at Robert E. Lee High School. Last year a good friend of mine, the amazing Kim Perry (I actually call her that too), invited me to spend Martin Luther King Jr. Day doing some community service. This past MLK Day marked the 25th anniversary of the federal holiday and I thought what better way to pay tribute to the great civil rights leader, and continue on a tradition that Kim instilled in me, than to spend my day off helping others. The holiday was officially designated as a day of service by Congress in 1994. So it’s actually supposed to be a “day on, not a day off.” A day when people from all backgrounds come together to strengthen the fabric of communities we live in. I invited lots of people to come out and serve with me. Greater DC Cares organizes a massive effort in DC to help a plethora of organizations; from revitalizing schools to helping feed the poor and hungry. On their website you can create a team and activate your own network to come together to work on a project. I signed up a Year of Giving team, however, the web-portal that Greater DC Cares uses for registration locked a week in advance so many of those who wanted to join me were unable to which I think was a shame. Fair question. I guess because I believe that if you really want to celebrate the holiday, and after all isn’t that why we are released from our work commitments on these holidays, the best way to do that for MLK Day is to volunteer your time to help transform the dream that Dr. King had of a “beloved community” into a reality. My team was part of a larger project that helped paint parts of Robert E. Lee High School in Springfield, VA. In all I think we had 40 volunteers there. Although I thought the service day lacked a little overall leadership and guidance for the volunteers, we managed to complete the task. The team I was assigned to gelled really well. What we lacked in the way of instructions we compensated with initiative, enthusiasm and compassion – not to mention a heavy dose of FUN. I really believe our team produced the best looking wall. Now to be fair we had a bit of an advantage. Several of the teams painted stripes down the hallways; we were assigned yellow, others had blue, red and green. Yellow is the lightest of the colors and hides flaws very easily whereas those who were painting more contrasting colors, such as blue and red, had a challenging time concealing the brush strokes that escaped the painting area. Volunteers at Robert E. Lee High School in Springfield, VA.
All in all it was good experience and I hope we created something that the high school students will appreciate – although I doubt that when I was a student I would have valued such an effort very much. Back then I just didn’t appreciate the challenges that schools face financially and value the efforts that were made by others to make the learning environment a more attractive space. Thanks to all of those who helped to keep Dr. King’s dream alive. For those of you who haven’t ever spent the day serving, make a commitment to do this next year. And for those of you in DC who can’t wait to get out and help your community keep checking my calendar for service events. Also keep an eye out for Servathon in April – two extraordinary days of service organized by Greater DC Cares that bring together nearly 5,000 volunteers to help 70+ nonprofits! I checked their website and they don’t have any information up as of today on the 2011 event, but hopefully they post it soon! Did you volunteer on MLK Day? If so, I’d love to hear about your experience! Want to see more photos from this event? Click here. 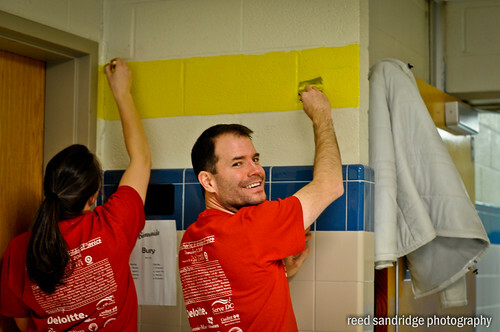 Hi Reed–thanks for your awesome blog post on MLK Day, and for volunteering! A quick apology re: the registration closing; because we organize so many volunteers, we have to shut down registration in advance for logistics purposes (t-shirt and tool organization and delivery, etc). Sorry about that–as a heads up, registration always closes about a week in advance of a day of service. I hope that you’ll consider creating a Servathon team! We are launching registration this week. Also, I think this blog is a very cool idea–can’t wait to see how your year of volunteering progresses. REED THIS IS SO EXCITING! THAT’S MY ALMA MATER! [Sorry – yes I was yelling – out of excitement.] Lee High Lancers! What a small world – Thank you so much for volunteering and making “my” school a prettier place. And don’t kid yourself – kids DO appreciate a nice place to learn – they DO notice. I know my kids do and I did/do too. I was a bit surprised tho’ that you were sent to FFX county – one of the richest counties in the US. [At least it used to be and should still be in the top] You would think with all the money in the school system there that they would have the funds to have people on staff to keep the schools kept up. Sad, actually, especially when DC public schools are in so much more dire need. Anyway – this is a “SMALL WORLD” moment. I really liked your post. I think it’s great that you’re so dedicated to volunteering. I work for an educational nonprofit in the Adams Morgan area called For Love of Children. We’re always looking for volunteer tutors – it’s more of a long-term commitment but we also offer “done-in-a-day” projects like painting rooms and leveling children’s books. Please let us know if you’re interested. I will send you an email to find a time to volunteer with For Love of Children!! A day on, not a day off-most of us missed this point over the years.